This section gives a brief overview of radiopharmaceuticals used in nuclear medicine. Their use in the treatment, imaging, and/or diagnosis of diseases isexamined. We also provide a neat recap of nuclear chemistry and provide a derivation of key equations you need to know. Radiopharmaceuticals are pharmaceuticals that contain a radioactive nuclide, sometimes referred to as radionuclides or radioisotopes. Radiopharmacology is the branch of pharmacology concerned with the study of radiopharmaceuticals.The field nuclear medicine is a branch of medicine involving the use of radiopharmaceuticals for the treatment, imaging, and diagnosis of diseases.Nuclear medicine is a specialised field that incorporates knowledge of medicine, pharmacology, medicinal chemistry, and nuclear physics and chemistry. In nuclear imaging, the radiopharmaceutical is administered to the patient then the emitted radiation is typically detected through the use of external detectors. The majority of radiopharmaceuticals in clinical use are based on the γ-emitter, technetium-99m (99mTc). This radionuclide is useful in the imaging and functional studies of the skeletal system, blood, lungs, liver, and tumours. In the case of 99mTc, gamma detectors are used to detect the emitted radiation. The generated images are studied by specialists in nuclear medicine.The ideal diagnostic radiopharmaceutical for imaging must be relatively cheap and readily available, have desirable pharmacokinetic properties, must be a γ-emitter, and must have decent target specificity. Compared to direct surgical visualisation, nuclear medical imaging is generally regarded as low-risk and non-invasive. 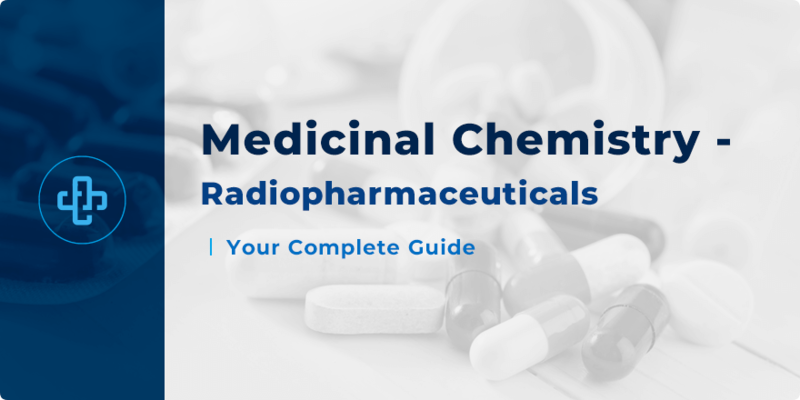 Radiopharmaceuticals may be salts, organometallic complexes, or chelate complexes. Radionuclides may also be attached to macromolecules such as monoclonal antibodies. The key feature of radiopharmaceuticals is the radionuclide. This article will go over some of the most common radionuclides in clinical use and in trials as well as examples of radioactive drugs. Advanced nuclear chemistry and nuclear imaging will not be discussed. In order to understand how radiopharmaceuticals work, it is important to go over the basics of nuclear chemistry as well as the decay processes that can take place. The reader is advised to go over coordination chemistry and have a periodic table of elements in hand when reading the rest of the article. Atomic nuclei are made up of two baryons, the proton and the neutron. The term nucleon refers to particles that make up the atomic nucleus. Stable atomic nuclei typically have proton-to-neutron ratio that is close to 1:1. In nuclear chemistry, nuclei are represented by the following notation. Atomic nuclei are generally unstable when the ratio of the nucleons is different to the optimal ratio of the atom’s stable state. Radionuclides are atoms with unstable nuclei that can undergo radioactive decay. Natural radioactive decay occurs spontaneously and is said to be stochastic (random). Radioactive isostopes (radioisotopes) occur naturally. However, it is also possible to produce radionuclides artificially. Radionuclides can be produced through the bombardment of stable nuclei with high-energy particles. Radioactive decay takes place when radionuclides undergo change from one nuclear state to another, or when a parent nucleus decays to give rise to a daughter nucleus with a different number of nucleons. Ionising radiation is emitted during decay. When interacting with matter, ionising radiation is capable of inducing changes in the atomic structure. There are several decay processes. Alpha decay, beta decay, positron emission, electron capture, and gamma decay will be described. Alpha decay involves the emission of alpha particles from the radionuclide. Alpha particles consist of two protons and two neutrons. Suppose the mass number of the parent nucleus is ‘A’ and the atomic number is ‘Z’. Following alpha decay, the mass number of the resulting daughter nucleus is ‘A-4’ and the atomic number is ‘Z-2’. α particles are identical to the helium nucleus and are essentially the charged equivalent. α particles are sometimes written as He2+ or α2+ to emphasise that they are charged particles. Unstable nuclei that undergo alpha decay are often heavy. 223Ra is an example of an alpha emitter. The general equation for alpha decay is shown below. Can you work out the resulting daughter nucleus when 223Ra undergoes alpha decay? Beta decay generally refers to the emission of β- particles. β- particles, which are sometimes referred to as negatrons, are high speed and high energy electrons.Beta decay occurs in situations where the number of neutrons is high compared to the number of electrons. During beta decay, a neutron is converted to a proton, which is followed by the emission of a β- particle and an antineutrino. The antineutrino is a chargeless and high energyparticle with very small mass, and is typically denoted by the Greek letter, nu (ν) with a tilde on top (shown below). The mass number remains the same during beta decay, but the atomic number increases by one. Samarium-153 (153Sm) is a β– emitter. 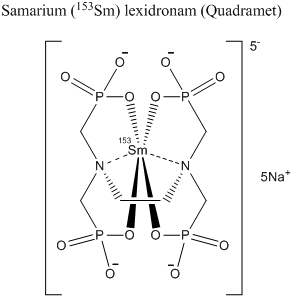 Samarium (153Sm) lexidronam (trade name Quadramet ®) is a radiopharmaceutical based on the 153Sm radionuclide. This drug is made by the formation of the chelate complex with the chelator ethylenediamine tetra(methylene phosphonic acid) or EDTMP with 153Sm. The drug is typically administered intravenously and is commonly used to alleviate pain due to cancers that have spread to the bone. Can you determine the resulting daughter nucleus when 153Sm undergoes beta decay? Expert. Opin. Pharmacother. 2006, 7(11), pp 1475–86. Positron emission refers to the emission of high energy and highspeed emission of the antiparticle counterpart of the electron, the positron (β+). This decay process typically occurs with proton-rich nuclei. The proton is converted into a neutron. This process is accompanied by the emission of β+ and a neutrino (ν). Positron-emitting radiopharmaceuticals have applications in nuclear imaging. Positron Emission Tomography (PET) (PET) is an imaging technique which uses positron emitters. Following administration of the drug and reaching of the target, the emitted positron interacts with a free electron from an atom. Two 0.511 MeV γ-ray photons are generated, and PET basically detects the generatedγ-radiation and produces a 3D image. The collision of an electron and a positron resulting in annihilation and the generation of γ-ray photons is known as electron-positron annihilation, which is sometimes referred to as pair annihilation. Fluorodeoxyglucose (18F-FDG) is used in PET. This radiopharmaceutical uses the positron emitter, 18F. This compound is administered intravenously. Fluorodeoxyglucose is mainly used in myocardial or tumour imaging.Fludeoxyglucose is a glucose analogue that is taken up by cells that use glucose at high levels such as the brain and cancer cells. Can you figure out the resulting daughter nucleus when 18F undergoes positron emission? Electron capture refers to the capturing of an electron from an atom’s electron cloud, usually from the K shell, which results in the production ofa neutron through the combination of the captured electron and a proton. One such radionuclide that can undergo EC is 123I. This conversion is accompanied by the emission of a neutrino and/ or γ-rays, which can be used in imaging. Secondary x-rays and the Auger effect may also be observed.The Auger effect is the name given to the phenomenon in which the filling of an inner-shell vacancy of an atom is accompanied by the ejection of an electron (Auger electron) from the same atom. Atomic nuclei have discrete energy levels. The ground state (g) basically refers to the nucleus in its lowest and often stable energy state while on the other hand, the excited state refers to energy states higher than the ground state. The metastable state (m) of the nucleus refers to excited states that are typically longer lived than ordinary excited states. The term isomeric transition (IT) refers to decay processes where nuclei at a high energy level change to a lower level by emitting γ-rays. During gamma decay, metastable nuclei basically decay from a metastable state to a lower energy state. This decay is accompanied by the emission of highly penetrative γ-rays. γ-rays are electromagnetic radiation of extremely high frequency and have wavelengths less than 10 picometres. In the case of γ-decay, the mass number and the atomic numbers remain the same. Single photon emission computed tomography (SPECT) is an imaging technique which utilises γ-emitters, such as 99mTc-based radiopharmaceuticals, to form 3D images. As mentioned earlier, these decay processes are stochastic andsimple radioactive decay processes follow first-order kinetics. The number of radionuclides that undergo decay per unit time (t) is described by the radioactive decay law. This law states that radioactive decay is proportional to the number of parent nuclei (N) present (1). Radionuclides decay at different rates, and each have a characteristic decay constant (λ). The decay constant is denoted by the Greek letter, lambda (λ). Where: N = number of nuclei at time t.
N0 = number of nuclei at time = 0 (i.e. initial number of nuclei). Equation (2) is acquired by integrating the differential equation (1) first followed by subsequent manipulations. The derivation of (2) is shown below. Radioactive decay is also described in terms of half-life. In the context of nuclear physics and chemistry, the term half-life (t1/2 or the Greek letter tau τ) refers to the time required for half the nuclei in a given sample to decay (7). These equations and mathematical relationships have practical applications. Suppose a radionuclide has a half-life of 9 hours. Suppose the radionuclide was bought from a supplier and it took a total of 13.5 hours to deliver the samples from the supplier to a hospital or a laboratory. By the time the radionuclide reaches the hospital or the laboratory, the amount of radionuclide would be lower compared to when it was sent out by the supplier. 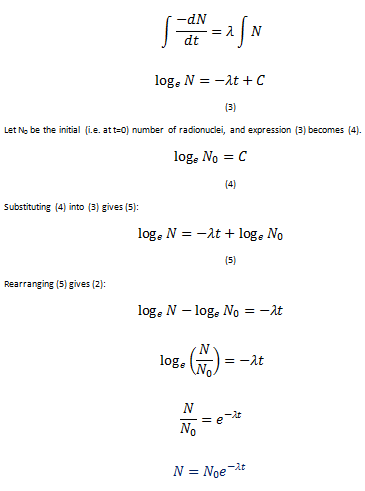 These equations can help determine the remaining radionuclide. This information would be useful during drug synthesis particularly in the determination of the yield. Radionuclides must have a suitable radionuclide half-life to be clinically useful. Τ values must neither be too high nor too low. The radioactive half-life of certain radionuclides is shown below. In this section, specific examples of radionuclides with clinical relevance will be discussed. There are many radiopharmaceuticals in trials or currently being used that contain different radioactive isotopes in their structure. Only seven will be focused on namely fluorine, iodine, gallium, thallium, erbium, zirconium, and technetium. The clinically relevant isotope of fluorine is fluorine-18 (18F). This radioisotope has applications in the field of oncology. 18F is generated in a cyclotron. As described earlier, 18F decays predominantly through positron (β+) emission to 18O. The generated γ photons from electron-positron pair annihilation are useful in imaging. This radionuclide has a short half-life of about 110 minutes. Due to the short half-life, synthesis of radiolabelled compounds must be done efficiently and quickly. C-F bonds are strong, making them ideal for attachment to biologically active molecules. The strength of C-F bonds was described in earlier articles, with an average bond dissociation energy of approximately 425 kJ mol-1. Fluorodeoxyglucose (18F), which is a glucose derivative, is typically taken up avidly by cancer cells with high glycolytic rates. Glucose and fluorodeoxyglucose (18F) are both phosphorylated but unlike glucose, fluorodeoxyglucose (18F) is not metabolised. The radiopharmaceutical begins to accumulate in cancer cells. As a result, these cells are detectable through imaging techniques such as PET. Iodine-123 (123I) and Iodine-131 (131I) are the radioisotopes of iodine with most widespread clinical use. 123I is produced through proton irradiation of 124Xe in a cyclotron. The radionuclide is isolated in the iodide form. 123I has a half-life of 13.22 hours, decays through EC and emits γ-rays, making 123I useful for imaging. 131I is produced by nuclear reactor neutron-irradiation of tellurium. 131I is the decay product of beta decay of 131Te. 131I has a half-life of 8.02 days and decays to stable 131Xe through β- emission. This β- emission is accompanied by γ-ray emissions of about 0.08-0.72 MeV. The major 0.364 MeV γ-ray has ideal tissue penetration for nuclear imaging. Due to this property, 131I radiopharmaceuticals can be used for therapy or diagnosis. On the other hand, 123I is used in situations when only imaging is the aim. Na123I (Sodium Iodide-123) can be administered orally or intravenously. Sodium Iodide-123is mainly used for thyroid imaging.Images of the thyroid are generated about 5 hours after administration. Iodohippurate Sodium I-123 is an intravenously administered drug used for renal imaging. Tositumomab and Iodine (131I) Tositumomab, sold under the trade name Bexxar ® was a drug used for the treatment of CD20 antigen-expressing relapsed or refractory, non-Hodgkin lymphoma. Iodine (131I) Tositumomab is a radioiodinated derivative of the murine IgG monoclonal antibody, tositumomab. Bexxar ® is an example of a drug whose sale and manufacture has been discontinued for reasons such as limited use. Gallium-67 (67Ga) is a γ-emitter that decays by EC. This radionuclide is produced from a cyclotron. 68Zn is bombarded with charged particles to give 67Ga. The γ-rays are detected by gamma cameras. 67Ga has a half-life of 3.26 days. Gallium scan (or gallium imaging) is the term used to call the imaging studies based on 67Ga. Imaging techniques include SPECT and SPECT/CT hybrids. Gallium compounds such as gallium-67 nitrate and gallium-67 citrate are employed to conduct such studies. The freely dissolved 67Ga3+ is the active form. 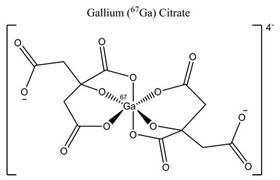 Gallium-67 citrate is a complex administered intravenously to the patient. Whole body images are taken 24, 48, and 72 hours after injection. Gallium tends to localise in various tumours as well as inflammation sites or infection sites. As such, gallium imaging has found application in whole-body surveys to localise source of fever in individuals with fever of unknown origin.Ga-67 mainly acts as an iron analogue. The radiometal binds to iron-binding proteins such as bacterial siderophores and leukocyte lactoferrin. These proteins are found in greater concentrations the sites mentioned above hence 67Ga3+ tends to concentrate at those sites. With the development of more specific radiotracers and alternatives, the use of gallium imaging has diminished. 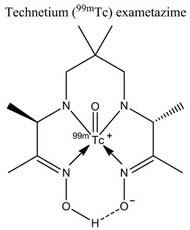 Thallium-201 (201Tl) is the clinically useful radioisotope of the group 13 element, thallium. The production of the isotope involves the use of a cyclotron and proton bombardment of 203Tl to generate 201Pb. The generated 201Pb decays to 201Tl through EC. 201Tl has a half-life of 3.042 days and decays to 201Hg through EC accompanied by the emissions of γ-rays. Like other radionuclides that emit γ-rays, imaging techniques that use gamma cameras are used. Thallous-201 Chloride is an example of a thallium radiopharmaceutical. This compound is mainly used in non-specific tumour imaging and myocardial imaging. Like samarium, erbium is an element in the lanthanide series. Erbium-169 (169Er) is a radioactive isotope of erbium with a half-life of 9.4 days. This radioisotope undergoes beta decay to thulium-169 (169Tm). 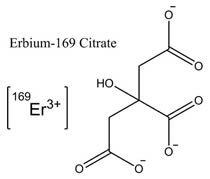 Erbium-169 citrate colloids are used as antirheumatic agents. Zirconium-89 (89Zr) is a positron emitter with a half-life of 78.4 hours (3.267 days) produced through proton irradiation of naturally occurring 89Y. There has been increased interest in positron emitters with longer half-lives than 18F and 11C. 89has potential applications in immuno-PET due to its primarily due to its long half-life. Intact monoclonal antibodies typically require 2-4 days before they caninfiltrate solid tumour. This makes 89Zr an ideal candidate for radiolabelled antibodies for the imaging of solid tumours. Moreover, the daughter nucleus of 89Zr’s decay is the stable 89Y which does not emit ionising radiation. 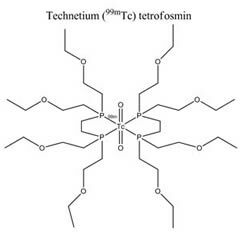 Technetium-99m (99mTc) radiopharmaceuticals were briefly introduced earlier. This section will discuss 99mTc in more detail compared to other radionuclides because it is the most widely used. 99mTc has a short half-life of 6 hours and decays to 99Tc with the emission of γ-rays. Scintigraphy and SPECT are some of the imaging techniques used. Due to 99mTc’s short half-life, storage is difficult. The ß-emitting parent nuclide, 99Mo is supplied to hospitals instead. Some medical establishments have access to technetium-99m generators. These are devices that extract 99mTc from decaying 99Mo. 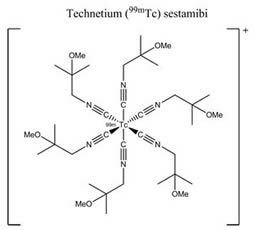 The isolated pertechnetate can then be used to prepare technetium radiopharmaceuticals such as technetium (99mTc) exametazime (Ceretec ®). This complex is used for the detection of altered regional cerebral perfusion in stroke. Re radiopharmaceuticals are often grouped with Tc because both are group 7 elements. Tc/Re radiopharmaceuticals are classified into three generations. 1st Generation: Known as Tc/Re Essential. Less target specific and generally used as perfusion agents. 2nd Generation: Contains a bifunctional chelator whose function is to chelate to the metal and have a targeting moiety. 3rd Generation: Uses the integrated approach. The targeting moiety of the pharmaceutical is directly bonded to the metal. The majority of radioactive Tc/Re pharmaceuticals in clinical use belong to the 1st generation. Examples include Technetium (99mTc) sestamibi (Cardiolite ®), tetrofosmin (Myoview ®), medronate, (99mTc-MDP) and the example given earlier, Technetium (99mTc) exametazime. It is also possible to attach 99mTc to monoclonal antibody. Technetium (99mTc) sulesomab (LeukoScan ®) is an example of a monoclonal antibody labelled with 99mTc. LeukoScan ® is used to image infections and inflammations in patients with suspected osteomyelitis. Note that for the rest of the article, the word ‘ligand’ will be used in the context of coordination chemistry rather than pharmacology. Cardiolite ® is a 99mTc complex with six monodentate methoxyisobutylisonitrile (MIBI) ligands. MIBI contains the isonitrile functional group. Isonitrile ligands are isoelectronic to CO ligands. These ligands form σ-bonds to the metal. As in metal carbonyl complexes, π-backbonding also occurs. As a result, the 99mTc-CNR bonds in Cardiolite ® tend to be strong. Cardiolite ® is administered intravenously and distributes in the myocardium proportionally to the myocardial blood flow. Using cameras to detect gamma rays as 99mTc decays, SPECT imaging of heart muscles is performed. Two sets of images are acquired, one at rest and one when the patient is stressed. These images are compared and then studied by the specialist. Myoview ® is a complex containing two chelating 1,2-bis[di-(2-ethoxyethyl)phosphino]ethane ligands. These diphosphine ligands are bidentate. Like Cardiolite ®, Myoview is used in the scintigraphic imaging of the myocardium when the patient is at rest and under stress. 99mTc-MDP contains two monoanionic and monodentate hydroxide ligands and two medronate ligands. This diphosphonate complex is primarily used for skeletal system imaging to investigate areas of altered osteogenesis. This imaging technique is useful for imaging bone metastases. Bone radioscintigraphy techniques are used to generate images. The key distinguishing feature of 2nd generation Tc/Re radiopharmaceuticals is the use of bifunctional chelators (BFCs). BFCs serve a dual purpose; one is targeting biovector conjugation while the other is coordination to 99mTc. Possible targeting biovectors include antibodies, receptor agonists, and small peptides. 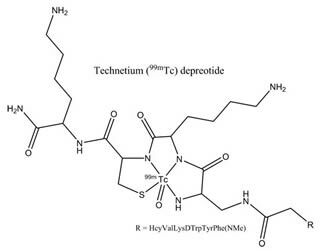 Technetium-99m depreotide (NeoTect ®) is an example of this generation. NeoTect ® is mainly used in the imaging lung cancers. Lung scintigraphy is the imaging technique used. The 3rd generation applies the integrated approach, which involves the incorporation ofstructural features of the targeting molecule with direct coordination to the radiometal. Clinical application of the 3rd generation has not been achieved to date. Radiopharmaceuticals have many uses in medicine. Novel ways of treating and diagnosing diseases continues to be an active area in medical research. Since nuclear medicine is such a broad topic, it was not possible to cover everything in great detail. The reader is directed to the following reading material should they require more advanced treatment of the concepts introduced here. J. Organomet. Chem. 2014, 751, pp 83-89. A. Giussani and C. Hoeschen. Springer-Verlag Berlin Heidelberg, 2013. Angew. Chem. Int. Ed. 2012, 51 (5), pp 1106–1109. Coordinating Radiometals of Copper, Gallium, Indium, Yttrium, and Zirconium for PET and SPECT Imaging of Disease. Chem. Rev., 2010, 110 (5), pp 2858–2902. Chem. Rev. 1999, 99 (9), pp 2269–2292.